Last week at a meeting of the Holy Synod of the Russian Orthodox Church (ROC), three decisions were adopted that illustrate the further transformation of church leadership into a fascist-type extreme right-wing organization. The rank of bishop was awarded to Archimandrite Tikhon (Shevkunov), abbot of the Sretensky Monastery in Moscow, who is closely linked to Black Hundreds-like organizations. For the last fifteen years, at least, his public and political reputation had prevented him from moving up into the ranks of the church’s “generals,” despite his successes in advocacy (the Sretensky Monastery’s publishing house is the largest in the ROC) and close ties to the Russian state establishment. Now decency has been cast to the wind, and the path to a big church career has been opened to him. In another decision, the Synod formed a joint commission of the Russian and Bulgarian Orthodox Churches on the issue of canonizing Archbishop Serafim (Sobolev) of Bogucharsk. It has been emphasized that the commission was created at the personal behest of Patriarch Kirill, who on May 5 sent a formal request to the head of the Bulgarian Orthodox Church. An émigré from Russia and, subsequently, one of the leaders of the Bulgarian Orthodox Church, Serafim is known not only as the man who practically founded modern Bulgarian monasticism. He also penned many xenophobic essays (just like Putin and Nikita Mikhalkov’s favorite philosopher Ivan Ilyin) that mixed the Russian nationalism of his day with a hatred of other faiths. In the 1930s, he vigorously campaigned against the theologians of the St. Sergius Orthodox Theological Institute in Paris, insisting on rejecting all forms of ecumenical cooperation. And of course, like the other so-called Karlovites, the European bishops of the ROCOR (Russian Orthodox Church Outside of Russia), he actively collaborated with the Nazis. This did not stop him, as a Russian patriot, from collaborating just as successfully with the Stalinist regime after the war. Sobolev’s most prominent Russian disciple and protégé was the young émigré priest known to us as Archpriest Vsevolod Spiller. To a large extent swayed by the ideas of his teacher, he returned in 1949 from Bulgaria to Moscow, where as deputy head of the Department of External Church Relations he was an influential church official. But then his ideas came into conflict with the political reality and, maintaining his post as prior of the Church of St. Nicholas in Kuznetsy, he became an equally influential figure in unofficial church life. In particular, he vigorously supported resistance groups within the church, which attempted to reconcile right-wing views with human rights rhetoric in order to gain greater autonomy for the clergy and the ROC as a whole. A group of young disciples from the Moscow intelligentsia formed around Spiller. In the early 1980s, they were ordained as priests, and by the middle of the decade they had begun to confront their own former comrades who had chosen a more liberal vision of the church’s future. During perestroika, they founded the most successful ecclesiastical education project of the new era, St. Tikhon’s Orthodox Theological Institute, and in the early 2000s, as a result of a large and successful intrigue, they became the leading ideological faction within the ROC. Members of this faction have held a variety of leadership positions in the church and still control at least two posts at the overall church level. One of these clerics is Archpriest Dmitry Smirnov, head of the Patriarchal Commission on Family and Youth Affairs. Smirnov is known for his aggressive xenophobic and extremist rhetoric (and his involvement in at least one major violent protest action), and he virtually acts as the church’s liaison with the extremist group God’s Will. There is no doubt that the prospect of Archbishop Serafim’s canonization and, therefore, the church’s blessing to republish and promote his works is the handiwork of St. Tikhon’s Institute, now known as St. Tikhon’s Orthodox University of [the] Humanities, especially since the university’s rector, Archpriest Vladimir Vorobyov, one of Spiller’s principal disciples, is on the canonization commission. “[We] consider concerns about the increasing spread of neo-paganism in countries for which the Moscow Patriarchate is canonically responsible, including the cultural and information sectors, reasonable. [We] emphasize the need to work more vigorously on the overall church and diocesan levels in order to refute the neo-pagan errors. This works must be conducted primarily with young people, with communities of athletes and sports fans, members of military-patriotic clubs, law enforcement officers, and persons in places of incarceration,” wrote the Synod in its resolution. This is a response to the clear failure in recent years of the Moscow Patriarchate’s efforts vis-à-vis “socially congenial” categories of young people. Despite the patriarchate’s desire to harness the energy of right-wing extremists and militarists in the youth subcultures to its own advantage by implementing the concept of military sports clubs in the parishes (there are definitely two or three such clubs in every region), it has become more and more obvious that the ROC’s “sluggish” stance did not satisfy its “flock” of extremists. 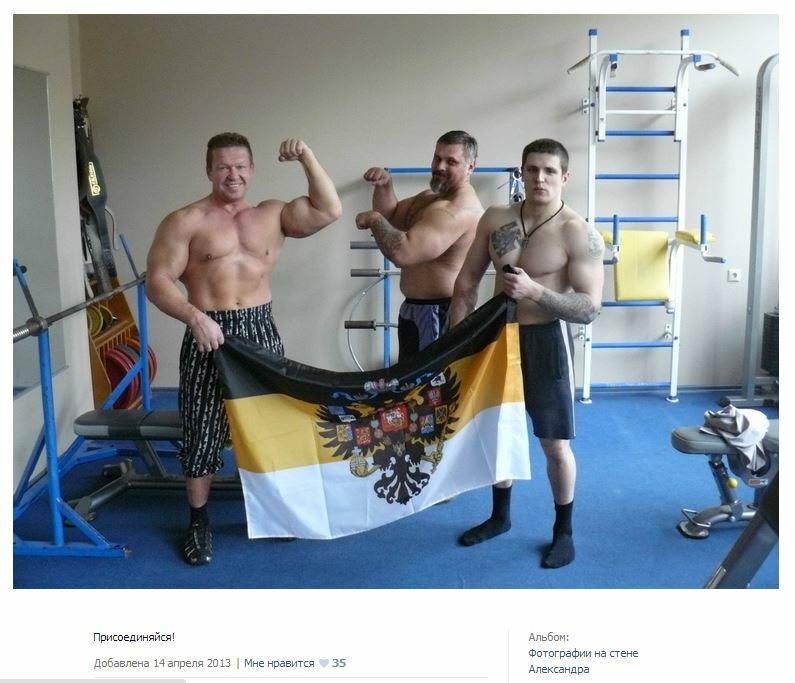 Emblematic in this regard was the sensational renunciation, in 2013, of Russian Orthodoxy by Alexander Povetkin, a boxer popular among Russian nationalists, and his virtual conversion to neo-paganism as publicly demonstrated by the tattoos and amulets on his body. Obviously, the ROC’s balanced position the Ukrainian conflict and its rejection of public anti-Ukrainian rhetoric has also caused dissatisfaction among patriotically minded right-wing radicals and facilitated their rejection of the church’s leadership. No wonder that Vsevolod Chaplin, whom the neo-Nazi gang BORN had considered as a candidate for assassination “for betraying the interests of the Russian people,” is now so worried about the religiosity of football hooligans, policemen, and convicts. In my opinion, these decisions by the Synod, which hammer away at the same point, are symptoms of the fascization of the church’s leadership. In this case, “fascization” is an academic term describing the process by which a subject of public space is indoctrinated with a certain set of ideas and practices. When it was under the authority of the communist regime, the ROC was frozen in terms of its ideological evolution for seven decades and is now going through the same stages that the major Christian churches of Europe went through during the twentieth century. If the “pre-modern” mystical obscurantism of the Black Hundreds had dominated under Alexy II, Kirill’s ROC has shifted into the phase of modernist fascist experiments, typical of Europe during the 1920s and 1930s. Statements by church leaders about the role of the “national leader,” the desired “unity of the people,” the sacred duty of war, and the special rights of collective subjects, which are more important than individual rights, and even the particular focus on young people are all phenomena from that earlier era and its rhetoric, just like militarized youth organizations in ecclesiastical communities. Everything having to do with the Russian profession of fascism and other versions of right-wing radicalism, which was quite popular in the Russian émigré community of the 1920s and 1930s, is thus only welcomed in the church at the moment. The Synod’s recent decisions testify to this fact. While it is a big problem for the church, “fascization” is not of paramount importance to society. The church is too small in terms of numbers [of parishioners] and too fragmented in terms of organization and ideology for these processes, which primarily affect the church’s administrative apparatus, to have a real impact on Russian politics on the federal and even local levels. However much some in the church leadership would enjoy commanding strictly serried ranks of militants, there are fewer and fewer people who would want to join the ranks of these militants, especially just for the heck of it. Therefore, there are many more generals in this army than soldiers. Meanwhile, the process of fascization, despite its unacceptability to modern society, has a variety of consequences. By itself, fascism was for its time a revolutionary movement, a form of catch-up modernization. It brought with it not only anti-democratic and xenophobic impulses but also the destruction of obsolete social institutions and barriers. It paved the way for new technologies, and provided means of social mobility and opportunities for young people. In this regard, the work of Patriarch Kirill and his team does not appear so straightforward. The ideological component of Kirill’s reign and his blunders in the realm of information policy have overshadowed to outside observers the efforts made by the patriarch and his supporters within the church over the past five years. Reform of the ROC’s administrative apparatus (the establishment of the Supreme Church Council, changes to the number and function of departments), the creation of quasi-democratic institutions (the Interconciliar Assembly, ecclesiastical courts, congresses of various categories of clergymen), the unification of church law, a significant increase in the number of bishops, and, finally, the retreat from old-fashioned ways of confessing the faith (i.e., the fight against eldership, mysticism, superstition, and flagrant ethnic and confessional xenophobia) and a policy of actively recruiting educated young people all have laid the foundations for the ROC’s further transformation into a more modern church. For an enormous number of rank-and-file (and not so rank-and-file) priests and lay people, it is not that all the games with black-shirted militants and the flagrant Russian nationalist rhetoric are completely unacceptable, but rather that they are absolutely trivial compared with other truths and values they associate with Russian Orthodoxy. Daily concerns about Sunday school, soup kitchens for the homeless, and, finally, their own wallets are much more important to them than the ideological “deviations” of the Moscow Patriarchate’s leadership. Especially because, even within the church, the leadership has been incapable of ensuring that brains are being washed in the right direction, much less clearly signaling its wishes. Thus, the real needs and concerns of these people in a modern, post-industrial society make it possible to express very different priorities in the work of Russian Orthodox communities than as seen by the higher-ups. Sooner or later (it is a matter, here, not of years but of “five-year plans”), these priorities will obviously come to be at odds with the church’s ruling elite and its small groups of radical supporters on the ground. And then the ROC will have its own version of the Second Vatican Council, “post-Gulag theology,” priests organizing pancake feeds for aggressive congregants, and all the other things modern Russian society expects from the ROC.